It's here. It's finally f*cking here. The third, official and final trailer for Star Wars Episode VII: The Force Awakens has been released. While the past two teasers have been awesome, they really haven't given us a lot. And I applaud them for that. This is a marketing campaign that should be studied by other studios, because this is some of the best marketing I have ever seen. We know practically nothing about this movie, and I'm glad. But I was hoping to learn a little bit more about the movie from this third trailer. While we got more story from this trailer than previous ones, we didn't learn a ton. While that's a good thing, I would have liked a little more story. The trailer establishes Finn (John Boyega) and Rey (Daisy Ridley) perfectly. We open the trailer with a strong Indiana Jones feel, as Rey searches the fallen Star Destroyer on Jakku. We are also introduced to Finn, who is not content as a Stormtrooper. 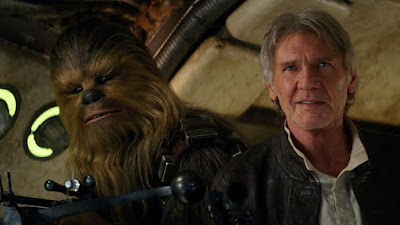 The two meet together on Jakku by accident, and are thrown into an adventure, which kicks off this new trilogy of Star Wars films. In this trailer, we get a lot of firsts. We hear Finn talk for the first time. 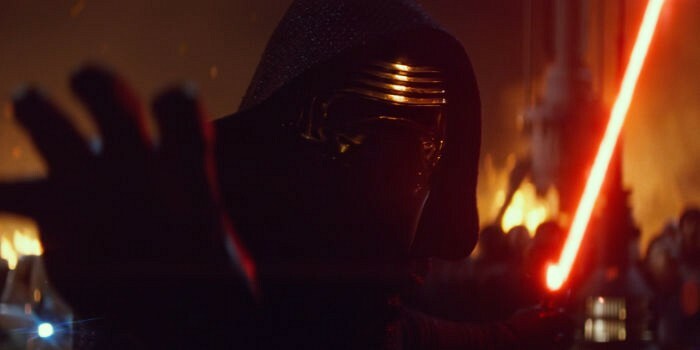 We hear Kylo Ren (Adam Driver) speak for the first time as well, and he sounds awesome. His voice is mechanical, like Darth Vader's, but it sounds unique. It's recognizable, like Vader's, so you know instantly that it's him when he speaks. What I take away most from this trailer is the scope of the film. The battles look epic, and the richness fills the screen. You are entirely encompassed by these action sequences, which makes it prime for being seen in IMAX. The cinematography is also spectacular. The camera sweeps elegantly, and it doesn't shake at all, like many movies do nowadays. Dan Mindel does a fantastic job as the DP, and I think an Oscar nomination is very possible for him. Mindel makes you feel that these sets, locations and green screen are real planets in a galaxy far, far away and that is something that deserves a lot of credit. The score by John Williams is also fantastic, but I have one problem with it. It doesn't sound like Star Wars. It's a beautiful score, but it doesn't sound like Star Wars. It didn't have that feel for me. I have commended the other trailers for their music, as they perfectly capture the essence and the feel of the original Star Wars. But this one doesn't. It probably will work perfectly in the context of the film, when I am immersed in the world. But listening to it for two minutes on its own, it just doesn't sound like Star Wars. But like I said, I'm sure it will be rectified when I see the film itself. I mean, it's John Williams. That's not a name to take lightly. What do you think? Did you like the trailer for Star Wars Episode VII: The Force Awakens? Are you looking forward to the film. If you're not, please tell me what's wrong with you in the comments section below.